Shrimp always seems like a special occasion food to me. I’m not sure why. Perhaps it’s because shrimp was expensive when I was a kid, so we only had it on special occasions. Or only when we went out to eat. 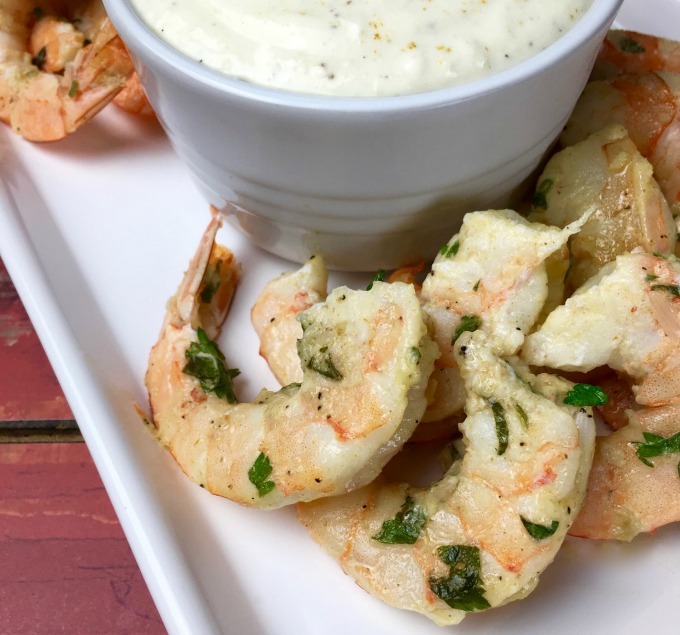 Whatever the reason, this Warm Garlic Parmesan Shrimp with Roasted Garlic Dip is a luxurious appetizer that feels really special. There’s a secret, though. It’s so easy to make. 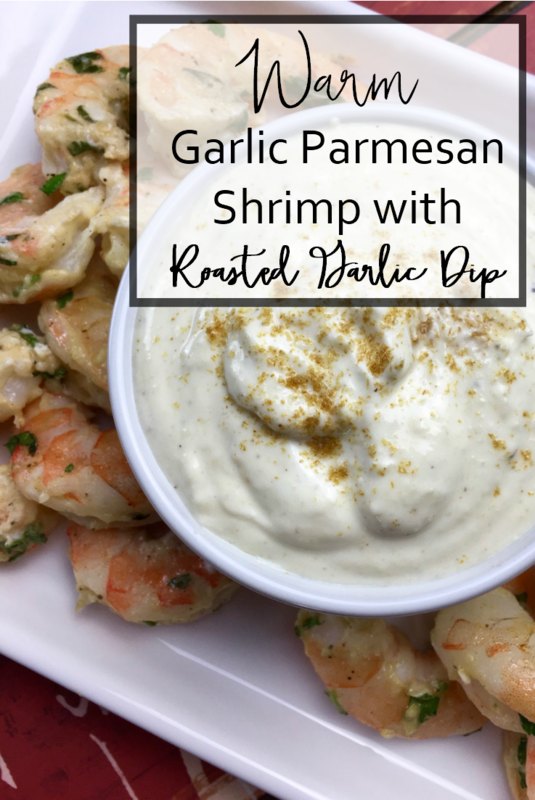 This Warm Garlic Parmesan Shrimp with Roasted Garlic Dip involves almost no active prep time, and very little active cooking time. Most of the cooking time involves roasting the garlic. And you can do that up to a couple days ahead of time. You can also roast several heads of garlic at once, and store them in a jar with olive oil. To make the roasted garlic dip, slice the top off the head of garlic, just enough so the cloves are exposed. Drizzle the cloves with olive oil and place the whole bulb on a small piece of aluminum foil and wrap tightly. While the shrimp is roasting, squeeze roasted garlic cloves into a blender or food processor. Add sour cream, Greek yogurt, lemon juice, lemon zest, ground cumin, and cayenne pepper. Blend until smooth and creamy. Season with salt and black pepper, to taste, and transfer to a small serving bowl. Remove shrimp from oven and sprinkle with lemon juice and fresh parsley. Toss to combine when cool enough to handle. 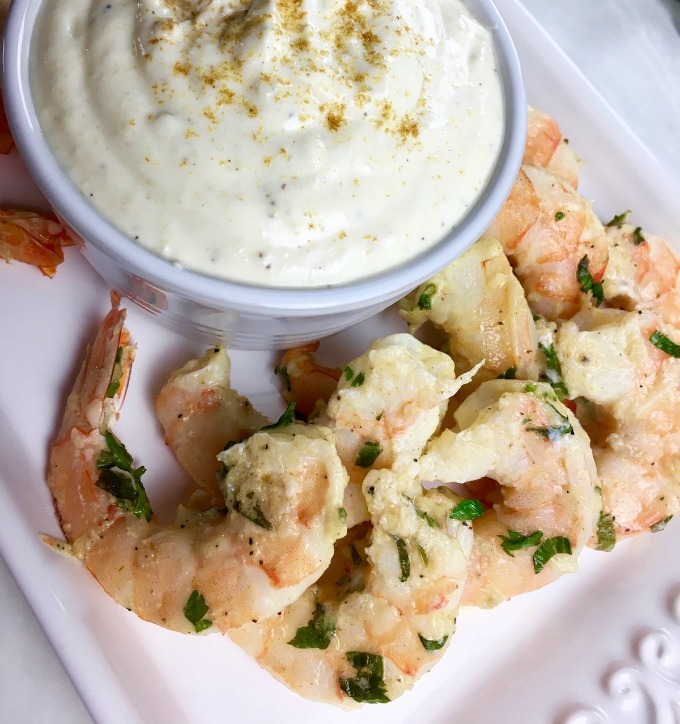 Serve immediately with the creamy roasted garlic dip. While we recommend serving the shrimp warm, they’re great chilled, too. You might also want to try the Roasted Garlic Dip with veggies or even chips. Pair this dish with a French 75 cocktail for a really special event.